Homeless Family or Adventure Travelers? On a recent trip to the public library we saw a man bathing, out in the open, with alcohol based hand sanitizer. He would take large handfuls and rub it under his shirt and pants. While this was an odd sight to witness at the library and would repulse many, it made me realize that he was just fulfilling one of the three basic human needs; food, shelter, and sanitation. These are the same basic needs of travelers, as well, but where do you draw the line at homeless or adventurer? What would you call a family that has no home, no job, and wanders around from place to place? While many would call this family homeless, others could see them as a family of adventurers out exploring the world. 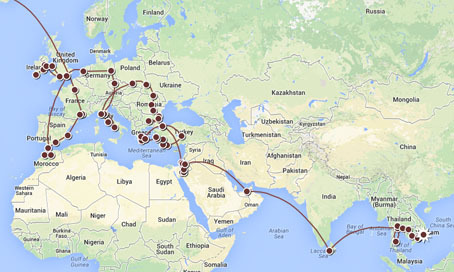 When we travel on our around the world adventure, I hope people see us as the latter. One of the big questions we have asked ourselves in planning for our round the world adventure is, “What do we do with our house?” We could rent out our house while we are gone, but we live in an area where the money we would get for renting out our house would not even cover our mortgage, let alone the insurance, taxes, and maintenance costs. The other option is to sell our house. While many prefer to keep their houses and move back in after they are done travelling, we have decided to sell ours. We will be able to travel more freely with no worries about our house, or having to arrange repairs and payments. This will also give us the option of resettling anywhere that we like after we are done travelling. But, this will also leave us without a home and we will be true vagabonds. I think that many people refuse to sell their homes before they go traveling on a round the world trip so they will still feel attached to something tangible and real. Most people find it hard to have no place to call home. But how can you really see and experience the world if you are tied to your house? It’s like trying to sail around the world without ever pulling up their anchor. It’s hard to let go! So back to my question of where do you draw the line at being homeless or being an adventurer. I think a lot of it has to do with your state of mind. Years ago I met a group of punk rockers that traveled up and down the west coast. In the winter they were in warm Southern California or Arizona. During the summer, they were in the Pacific Northwest where summers are near perfect. They traveled with the weather as migratory birds do. They had no place to call home, no jobs, panhandled on the streets for their money to buy cigarettes and alcohol, ate their meals at soup kitchens, and seemed happy. They were out seeking adventure. I have also met a lot of hippies that traveled around the country following the Grateful Dead. Many lived in much the same way as the punk rockers, and were happy. But many of the homeless you see on the streets and in the homeless shelters are very unhappy. So why would one group of “homeless” people be happier than another group of “homeless” people? I think it has to do with travel. Travel is adventure. You never know what is around the corner and what wonders you might find and it gives you something to look forward to; a goal in life. I feel that it is not lack of a home that makes someone “homeless.” It is the lack of travel and adventure. But I am not saying we can solve homelessness by buying a person living on the streets an airline ticket somewhere, I am just saying we shouldn’t judge a book by its cover. Some of those “homeless people” might be traveling on the cheap and having the time of their lives. Now when we sell our house and head off into the big unknown, we are going to be doing things a bit differently than the punks and dead heads, or so we hope. We will not be sleeping under bridges or Volkswagen vans, nor begging for food or money. But we will hopefully experience the same awe and wonder that anyone who travels should feel. Sure we won’t have a house, but we will have a world in which we can explore. I am not sure if it was the Cops episode with the meth dealers and prostitutes, the Hawaii Five-O episode with the murderous hillbilly cannibals (the strangest Hawaii Five-O ever! ), or watching the morning news on the other Hawaiian islands that showed Honolulu’s 6-lane freeways with bumper to bumper rush hour traffic. All I knew was that I had no desire to take a trip to Honolulu and Kerri agreed. But after visiting the Big Island of Hawaii twice, Maui once, and we were planning a trip to stay a week on Kauai that would have us change planes in Honolulu, we figured we might as check the island of Oahu off the list too. After all, we were already going there to change planes. The plan was to stay 3 nights in Waikiki and visit Pearl Harbor, the North Shore, and any other must-see touristy thing we can find. We were not planning on coming back to Oahu for a visit, so we might as well do everything on this trip before heading over to Kauai. After landing at the busy Honolulu International Airport we picked up our rental car and made our way to the heart of tourist hell, Waikiki Beach! 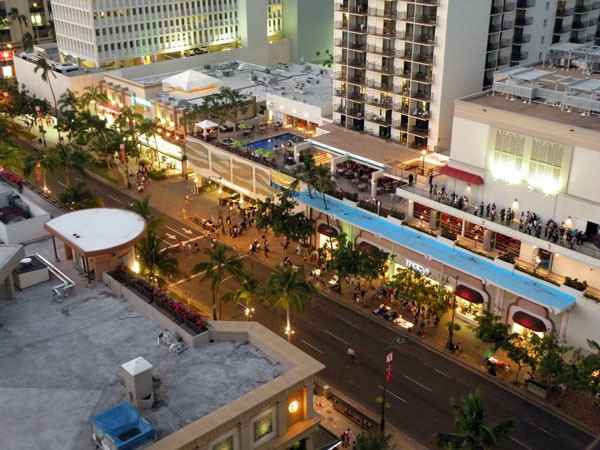 Since our time was limited we decided to splurge a little and stay right in the heart of everything at the Outrigger Waikiki hotel. After checking into the hotel we made our way down to enjoy the famous stretch of sand of Waikiki Beach. We were shocked to see how crowded the beach was. We had to walk about 100 yards before we found a spot big enough to lay down 3 beach towels. It was crowded! But the sand was soft, the water warm, and everyone had a smile on their faces. I can easily see why people flock here. We enjoyed our first day playing in the ocean and talking to the other families that had their beach towels just inches away from ours. “Three to four hundred,” I asked. “Three to four THOUSAND,” she replied. I think I will stick to using the clock on my cell phone. The next morning we got up early and made our way up the freeway to Pearl Harbor. This was the biggest reason for coming to Oahu as Kerri’s great uncle is entombed on the USS Arizona and we felt we should pay our respects and learn a bit more about the history of Pearl Harbor. Upon arriving we soon found that due to increased security you cannot bring any bags into the visitor center, not even a purse or camera bag. So after a quick trip back to the rental car, we made our way inside and were given a timed ticket for our boat ride out to the memorial. 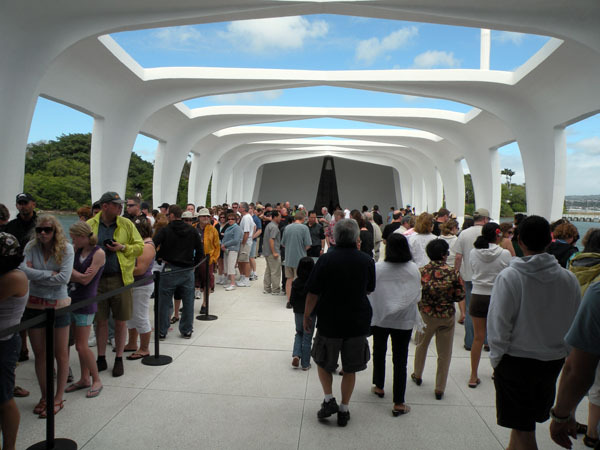 We were surprised that the Pearl Harbor Visitor Center, Museum, and USS Arizona Memorial did not charge admission. We were also surprised at how small the museum was. As we strolled through the visitor center we noticed that everyone spoke in hushed tones. It was a very solemn place and not what we had expected for such a popular place for tourists. We were especially thankful that Sydney was well behaved. As our time approached we got in line and were led into a small movie theatre where we were shown a short movie on the history of Pearl Harbor and were informed of the proper protocol for going out to the memorial. Basically, don’t talk and show respect. We loaded onto the transport boat and US Navy personnel motored us out to the memorial, which is built directly over the wreck of the USS Arizona. The wreck still contains the remains of the sailors who died when she sank during the Japanese attack on December 7, 1941. The memorial is a VERY solemn place with a wall listing the names of all the Americans who died in the attack. Looking down into the water you can see oil still coming to the surface. It was very quiet. 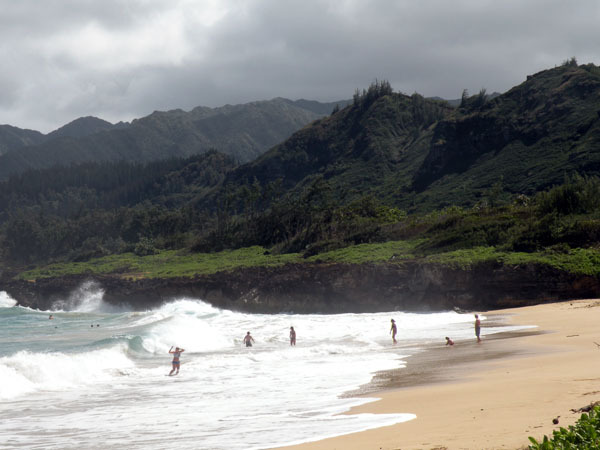 After leaving Pearl Harbor we headed north to check out the famous North Shore with its big surf. Along the way we found the Dole Pineapple Plantation, an attraction that someone had recommended. So, we stopped and took the train ride around the plantation and toured the gardens. It was cheesy, but we can now say we have been there. Back on the highway we continued north and came to Oahu’s North Shore. We had imagined it to be extremely developed and commercialized, but it was far from it.We noticed that there were shrimp wagons selling shrimp plates. And since it was lunch time we stopped at a nice looking one and had some of the best shrimp we have ever had. As we drove down the road that follows the beach we saw the signs for all the famous beaches, such as Bonzai Pipeline and Sunset Beach. We stopped at one of the beaches and went to check out the massive waves pounding the sandy beach and let Sydney play in the sand. We were impressed to see surfers out trying to surf the frothing ocean. We continued along the road enjoying the rugged beauty of Oahu’s North Shore. We had considered stopping at the Polynesian Cultural Center, but with the limited time we had and their prices, we decided to skip it. After circling the island we finally got back to our hotel and hit the beach. The next morning we decided to climb Diamond Head. We were not sure how well Sydney would do, but we were willing to give it a try. We brought along lots of water and headlamps and started up the trail. After hiking up the ¾ mile hike and climbing numerous stairs and going through a long dark tunnel, we made it to the top. We were surprised to find an old World War II bunker at the top. The views of the valley below with Honolulu and the Pacific Ocean were amazing and we took lots of photos. We hiked back down and enjoyed Hawaiian shaved ice in the parking lot. After driving back to the hotel we played on the beach until sunset and then enjoyed our final night on Oahu exploring the shops and eateries of Waikiki. While we were expecting our trip to Oahu to not be a good one, we were really surprised that it was a lot of fun. 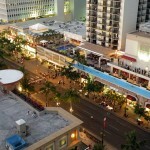 I especially liked Waikiki and if we were ever to move to Hawaii, I would want to live right in the middle of Waikiki. 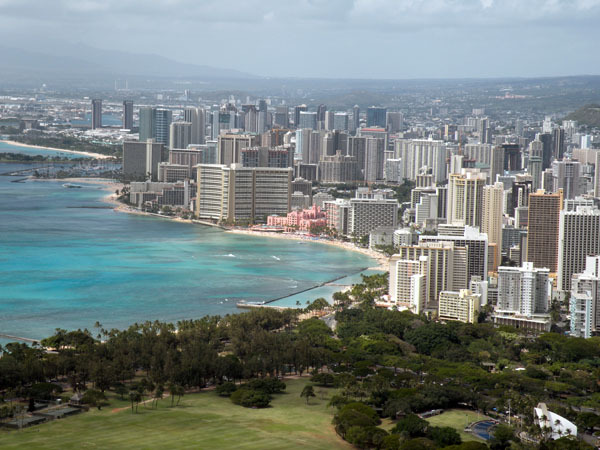 It is close to a great beach, a great park with a zoo, Diamond Head, shopping, it’s very clean, the locals are very friendly, and it has a great vibe to the place. Sure it has a lot of tourists, but so do a lot of other places. The prices are high, but the weather is perfect and the activities are plentiful. It could be a great place to live after we are done traveling the world.